Further rail price hikes get the year off to a difficult start for many and meanwhile, the government remains entirely oblivious to the impact of its policies. The annual hike in rail price has reared its ugly head and marred the start of yet another year. The BBC reports overall ticket prices in England, Scotland and Wales have risen by 3.9% with season tickets specifically rising by 4.2%, yet again hitting commuters in the wallet. According to analysis undertaken by The Independent, those who use the trains are now faced with price rises of up to 10% as they return to work. This puts UK train fares as the most expensive in Europe. The figure quoted by the Indy – that of up to 10% rises – is contrary to the government limiting price rises at 4.2% for regulated fares; the 10% is in reference to some of those unregulated fares, such as an “anytime” return trip from London to Norwich. Unfortunately, however, the figures of price increases do not include the increases in bus travel and in London Underground prices, both of which will further contribute to the ever-rocketing price of living in the capital. Price hikes have sparked protests from transport campaigners, including one at St Pancras yesterday morning. 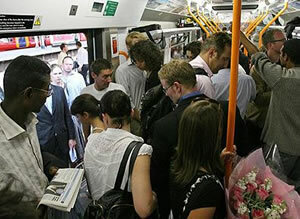 Campaigners claim season ticket fares have risen by 50% in the past decade, with the TUC adding train fares have risen three times faster than average wages since the beginning of the recession in 2008. Neither statistic paints a positive message for a population already grappling with the realities of recession and austerity. Labour is weighing in on the issue, arguing it would put caps on all train fares and resist pushes from train companies for higher fares, moves not made by the Tory/Liberal government. With the year starting with gloomy news for commuters and immovable and dogmatic policy from the coalition, the outlook is an extraordinarily bleak one. Happy New Year!